Home / غير مصنف / UK WEATHER: Climate-flip? Half UK in for drenching and half to sizzle, which will YOU get? UK WEATHER: Climate-flip? Half UK in for drenching and half to sizzle, which will YOU get? In complete contrast to previous days the South is to be drenched today while much of the North will be dazzled by Mother’s Day sunshine. 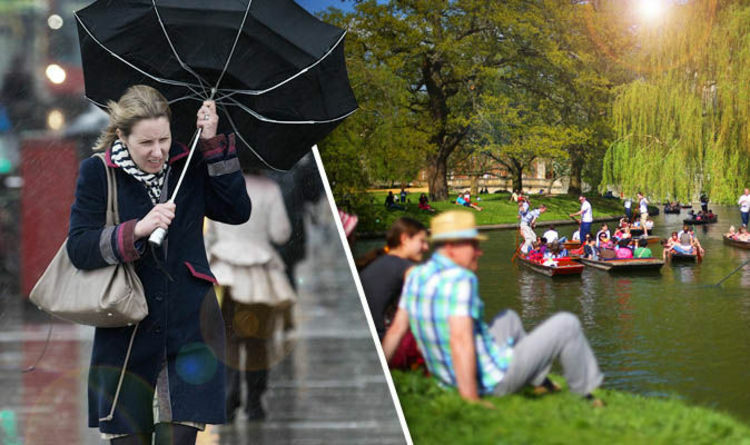 Heavy rain and thunder is set to hit much of the South of England - while in the North and Scotland, there will be bright and sunny spells on Mother’s Day. Kew Gardens in south-west London has already had 15C (59F) temperatures today, making it the warmest mercury of the year so far, according to the Met Office. Only recently Britain was lashed by the Beast from the East - with historic levels of snow falling in the capital and across the country. But while milder weather is expected to stretch into the next week, Mother’s Day will be wet and windy for southern parts of the country. That means that sons will have to keep their mothers indoors to stay out of the rain in many parts of Britain - or face a whitewash of their carefully planned outdoor activities. BBC Weather’s Ben Rich had already warned that those in the south of the UK should expect “hefty showers” on Saturday. He said: “A very mild start to Saturday. A mild start to what is going to be a mild weekend. With that though we will see spells of rain. It will often be very cloudy as well so low pressure still in charge." Met Office forecaster Alex Burkill said: “Northern parts should have a pretty dry day. “In the south there is a risk of thunder and heavy rain. Temperatures will fall slightly tomorrow, with expected highs this week of between 13-14C (55.4-57.2F). As spring blooms, Brits will increasingly enjoy warmer and more temperate climate, as is customary at this stage in the year. Forecasters are expecting the weather to pick up through March and into April, when ‘summer sports’ - like Cricket - will begin again and will need the Rain Gods to look kindly on them. Patchy rain will continue across many other parts of the country tomorrow, although showers should mostly clear up by Tuesday - which is forecasted to be the hottest and sunniest day of the week. Burkill added: “At the end of the week, from Wednesday onwards, western parts are more likely to see rain. Further east, it will be drier.